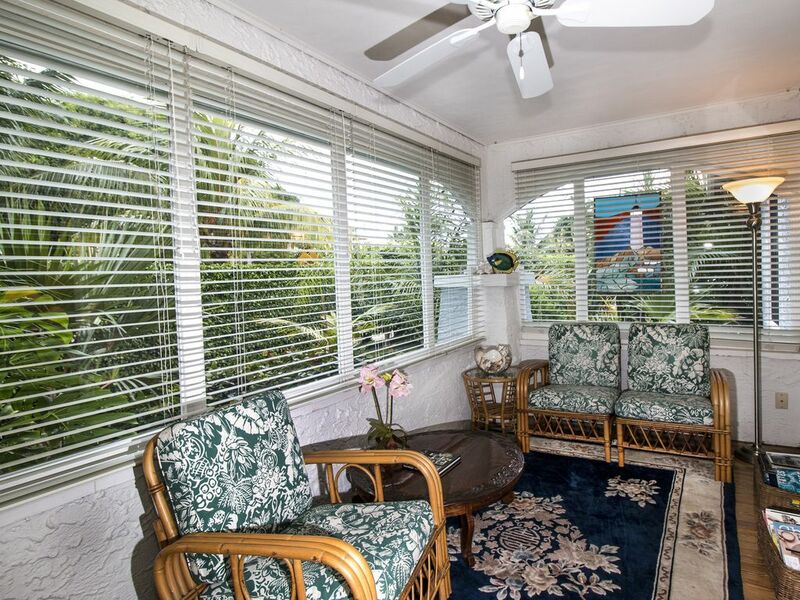 Hidden in Florida's "Gold Coast," this private, tropically landscaped, secluded property is a 3 Bedroom compound that has a 2 bedroom, 2 bath house and a 1 bedroom, 1 bath cottage. Both with central air conditioning and heating. The heated swimming pool is between the house and cottage. The intracoastal waterway is 2 blocks away, the Atlantic beaches are within 5 minutes and the Palm Beach Airport (PBI) is only 10 minutes away. Very nicely located in the South End of West Palm Beach. Visit Cape Canaveral, Orlando and Miami - ideal for day trippers. Spend the day at Palm Beach, Pompano Beach, Boca Raton or Ft. Lauderdale. Shopping and restaurants that feature incredible seafood are close by or play golf at one of the many courses nearby. Just go fishing and grill your own catch by the pool. Amenities: Private swimming pool, sun deck, Central heating and air, Cable TV and DVD, fully equipped kitchen, Fireplace, Complete laundry facilities, Outdoor gas BBQ. Activities: Intercostal Waterway, Fine Dining & Sidewalk Cafes, Shops, Galleries, Golf, Bike paths and Hiking trails, White Sand Beaches, Fishing, Boating, Health clubs, Sight Seeing Tours, Zoos, Visit Orlando or Miami. Very nice and spacious we loved the place. Very clean, great for our family trip! Stayed here for 5 days. Very nice pool and backyard. Great neighborhood, Tim and Linda are super nice! Great hospitality. Very comfortable and clean. Good location. Tim and wife were great hosts, very helpful. Very comfortable property. Overall wonderful stay! Four of us stayed for a week in this home for a family reunion. I can't say enough about how nice it was. The home, with a lovely sun room, living room and dining room was charming. The backyard garden and pool made the setting really wonderful. I've stayed in many vacation rentals and never have I had the kind of luxury towels that were provided. This kind of attention to detail makes the experience all the more special. Thank you, Tim and Linda! Second year in a row for us staying during baseball tourney. Can't beat the pool and laundry and not having to share. Tim as always was a super host! Group of 6 guys came down for spring training. Very clean, comfortable beds, semi-private. The owner lives next door and stays to himself. 15 minutes to Roger Dean Stadium. Less than 2 miles from the beach.